Born in the same year as Magnus Carlsen and Sergey Karjakin, Nepomniachtchi initially had the edge over his rivals, winning the European U10 and U12 Championship (twice) and claiming the 2002 World U12 Championship ahead of Magnus Carlsen. He subsequently admitted that the success had gone to his head and he lost focus, allowing his peers to press ahead. Nevertheless, his talent never went away. In 2008 he won the Aeroflot Open to qualify for the first supertournament of his career in Dortmund, where he finished joint second — half a point behind Peter Leko and ahead of Vladimir Kramnik. He really made his mark, however, in 2010, when he won the European Individual Championship and the Russian Championship and also starred for the Russian B team at the Olympiad in Khanty-Mansiysk. He began to be invited to the top tournaments and didn’t look out of place in Wijk aan Zee 2011 or the incredibly strong Tal Memorial later that year, where he beat Vladimir Kramnik and drew his remaining games. It was strange, therefore, that 2012 was a year to forget for the tactically-gifted Russian. He wasn’t invited to the Tal Memorial or to play for the Russian team at the Olympiad, failed to qualify for the Russian Championship and saw himself overtaken on the rating list by another Russian player born in 1990 — Dmitry Andreikin. A gifted blitz player, "Nepo" (as he's often called) came clear second in the 2013 World Blitz and Rapid championship (a half point behind Shakhriyar Mamedyarov), and won the 2015 Moscow Blitz Championship, a half point ahead of Andreikin. 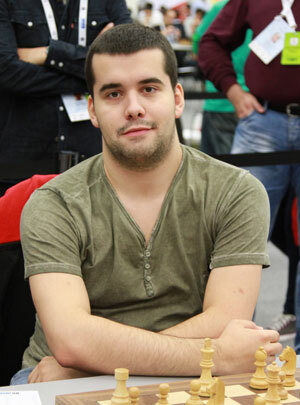 Nepomniachtchi has spent some time working as Magnus Carlsen’s second. Chess fans will hope he uses that experience to eventually mount an assault on the World Championship title himself in the years to come. I can remember that. I watched his games on internet when he's playing world cup under 12. Great player!